Can we talk for a few minutes about pickles? Dill pickles, that is. Many people that I know love anything pickled, but I’m not one of them. I like pickled beets well enough, but I love dill pickles!! Years ago I remember helping my mother make pickles and it seemed like a lot of work. I know there was some cooking involved, the hot vinegar bath, I think. And I remember those little round dill seeds and black peppercorns. It has always seemed lots easier to just buy the kind I like at the grocery store. So I’m very proud of myself when I say I made refrigerator dill pickles, and they were so easy. Nothing at all like what I remember. This recipe is so ridiculously simple, I wonder why I never heard of it until just this year. I can’t believe I got these fantastically crisp and fresh pickles with only a few ingredients. You can use traditional cucumbers or pickling cucumbers for this–whatever you like. Some of the pickling cucumbers end up being quite fat and round, so I used regular cucumbers because I wanted long spears. If you have 10 minutes you can make these pickles. Just watch me! About the jars: They can be any jars saved from other products and repurposed, just be sure they are really clean with no lingering odors. It’s wise to wash them in the dishwasher prior to using again. 1. Add 1 minced or pressed clove of garlic and a few sprigs of dill to the bottom of each jar. Don’t stress over exact amounts. They will be great. Place sprigs of dill in bottom of jars. Add a clove of garlic. 2. Cut the cucumbers into spears or whatever shape you like. Add the spears to the jars, packing in as many as you can without having to force them in. Pack the jars with cucumbers. 3. In a large liquid measuring cup or pitcher, combine the water, vinegar, and salt. Stir well until the salt is dissolved. Pour the mixture into each jar over the cucumber spears so they are completely covered. Top with an additional few sprigs of dill, if desired. Add vinegar brine, then more dill on top. 5. Refrigerate for two days. Enjoy! Continue to store in the refrigerator….presuming there are leftovers, of course. Oh my gosh–these are fantastic. As soon as you finish one your mouth wants another. We couldn’t stop eating them. Mr. D. says they are better than “real pickles”. What ever that means, I think it’s a compliment. A great sandwich deserves a great pickle! I will be starting my next batch before the first batch is gone, because I won’t be able to wait the two days for a second batch to “cure”. Ya gotta plan ahead when you love something this much!!! Yes, it was Super Sunday, and no we didn’t watch the game, go to a party, or cheer for any particular team, but I did use game day as an excuse to make some foods associated with game watching. I guess I’m more interested in food than football! 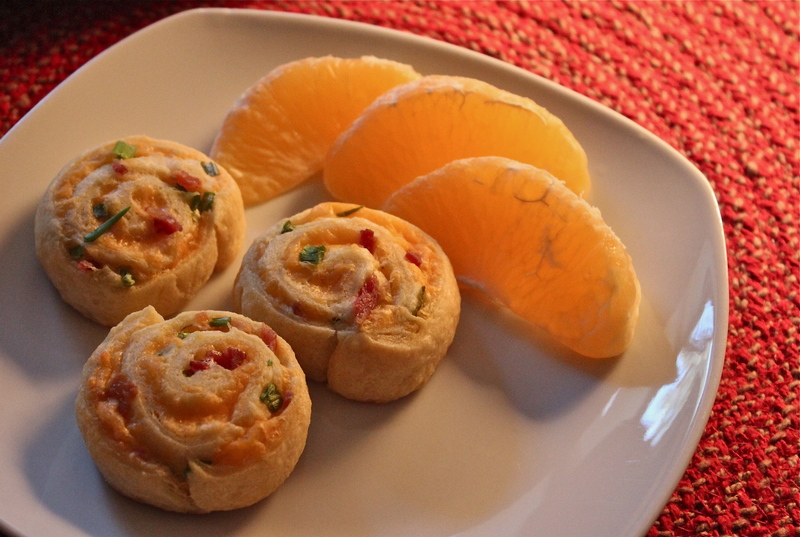 Anyway, I made these easy little pinwheels that we enjoyed for lunch with some fresh fruit. Then I went on to make a chicken quesedilla casserole for dinner. I’ll be telling you about that in a few days. so stay tuned. 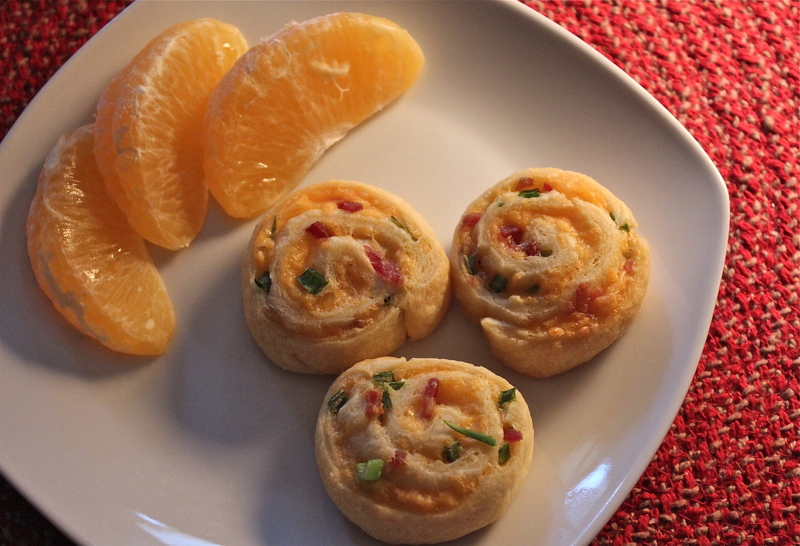 These easy to hold little pinwheels make a great appetizer, combining two flavor favorites; bacon and cheddar cheese, wrapped into crescent roll dough. You can eat them with your fingers, no utensils required, while in the other hand you hold your favorite beverage. A neat party food, I think. One that guys will like–at least my husband did. In fact, he asked me to make them after seeing them in a picture. Turns out he was on the right track with that suggestion. I liked them very much too. 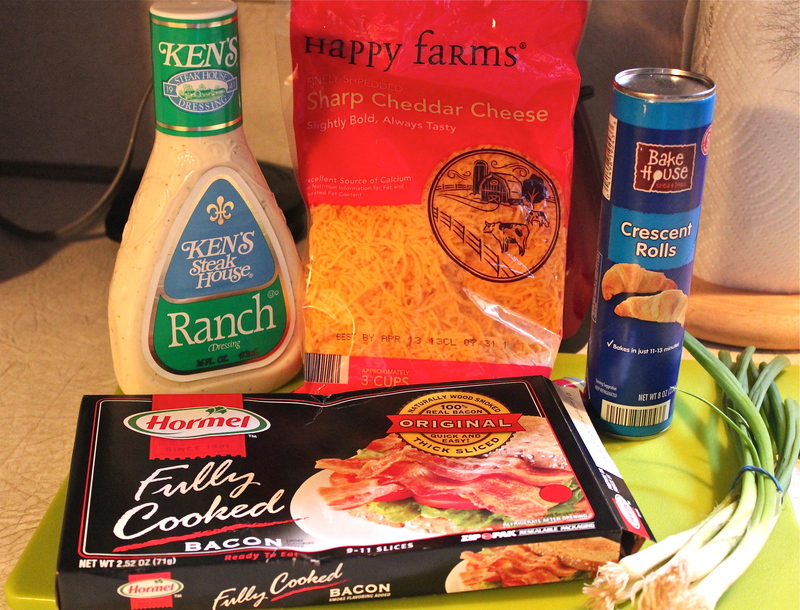 Just a few ingredients, you probably have on hand. Yield: Makes 12 – 16, depending on how thick you cut them. 1. Preheat oven to 350* F. Spray baking sheet with non-stick spray or line with parchment paper. 2. Unroll the crescent roll dough; pressing each section into a 12 x 4 inch rectangle, firmly pressing the perforations to seal. 3. 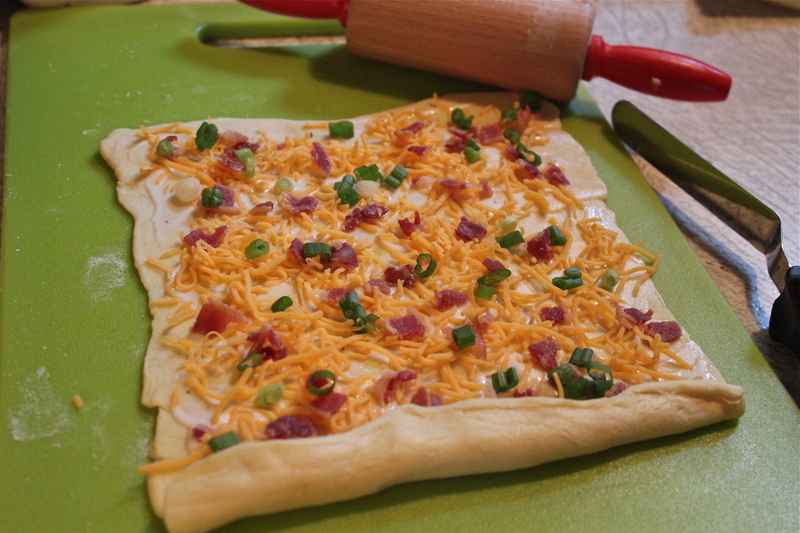 Spread 1 Tablespoon dressing over each dough rectangle to the edges. 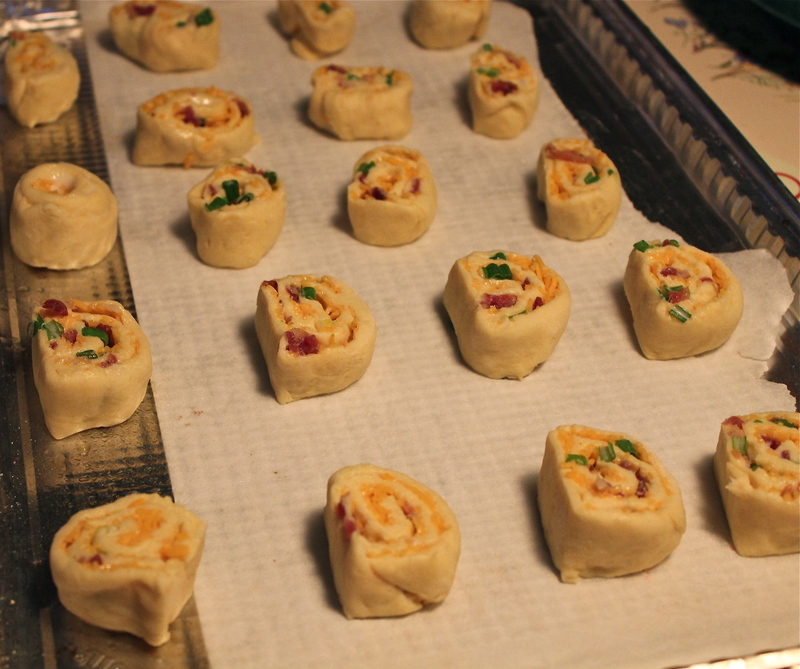 Sprinkle each with bacon, cheddar cheese, and onions. Layer on the fillings, then roll up. 4. Starting at one short side, roll up each rectangle; press edge to seal. With serrated knife, cut each roll into 6-8 slices; place cut side down on prepared baking sheet. 5. Bake 12 – 17 minutes or until edges are deep golden brown. Immediately remove from baking sheet. Serve warm. Served warm with fruit for a light lunch. 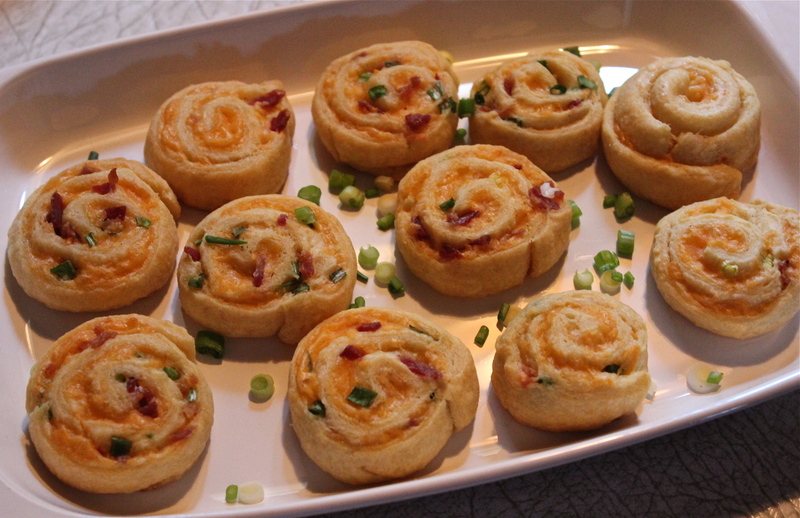 Bacon Cheddar Pinwheels, a neat little appetizer. This is just the thing for your Super Bowl Party! Pimiento cheese dip is one of those comfort foods that can serve as a really delicious appetizer or as a cheese spread. If you’re looking for a whole lot of comfort, use the spread to make a sandwich on white bread and grill it like grilled cheese. (Sublime!) If it’s an appetizer you’re after, put it in a small bowl or serving dish, and surround it with chips, crackers, toast points, or celery sticks. Whenever I’ve been served this dip I found that if you don’t get to it when it’s first put on the table, there won’t be any left in a few minutes. Everyone seems to really like it, and its extremely easy to make. Beat the shredded cheddar cheese, mayonnaise and softened butter or cream cheese in a mixing bowl with a mixer on low speed until well blended. Add the pimientos, garlic powder, salt and sugar; mix to combine. Stir in the pecans if using. Additional notes: This recipe can become too salty, if using salted butter, so taste before adding the salt and adjust amount accordingly. This becomes particularly important if serving with salty chips or crackers. Another nice addition is chopped black olives especially if serving with finger-cut raw veggies. This does not last long once put out on the table.